Some time back, I posted an article about the VARK learning styles and concluded that the concept is pretty hypothetical (according to some researchers) and practically speaking, it would be a tough job for an ID to run a VARK check on all learners she/he is designing a course for (according to me and many other IDs…). Personally, I am pretty much a trimodal learner and no matter what researches say, I can never deny that preference to learning styles does aid learning. A simple voice-over can equally aid comprehension as a simulation or an elaborate graphic. It is important to research a bit about the going rates of voice-over artists you choose for your course. Our second condition is whether it fits the budget. Here is a very good way of figuring out how much time will it take for your script to be recorded. 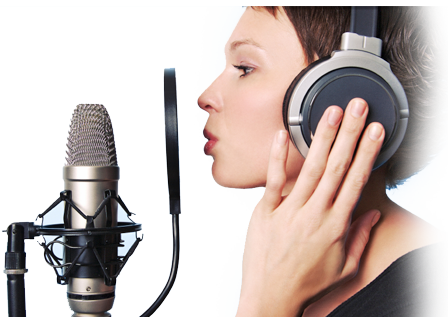 It can help you get an estimate of how much a voice-over script recording will cost. Let’s face it. Most instructional designers are not techies. And with so many authoring tools doing the rounds in the present elearning market, its practically impossible to keep a tract of all or even be able to work with all to understand the intricacies involved in each one. Though the coming of WYSIWYG (What-You-See-Is-What-You-Get) authoring tools has made life much simpler, there are other issues like the browser compatibility or system requirements that still baffle the simpler people. 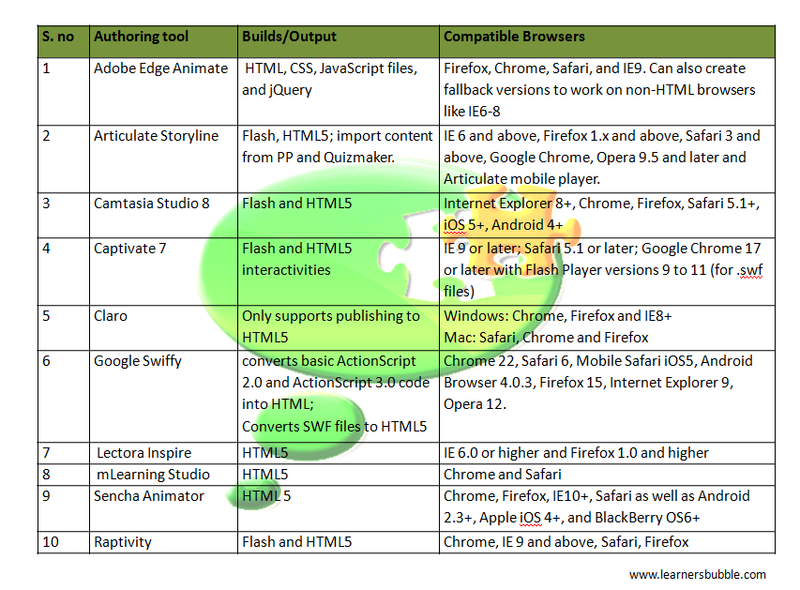 Here is a compilation of the 10 most used authoring tools in the market today along with the output they have, and the browsers they are compatible with. If the authoring tool you are using does not feature here, the best way would be to publish and view your courses in some browsers to figure out which feature is supported and which isn’t. You may have developed an uber cool elearning course for your audience, but if it doesn’t work when deployed, it’s useless. Many of the authoring tools, like Captivate, have options to publish courses in Flash (for desktop viewing) and HTML (for iOS devices). You can checkbox them according to your need. If you want to quickly get a feel of any of the authoring tools you have not used in the past but would like to, here’s a trick. For most of them 30-day free trials are available with an exception of some features ofcourse. So you can download that and see how it works or looks and what all it can do for yourself. 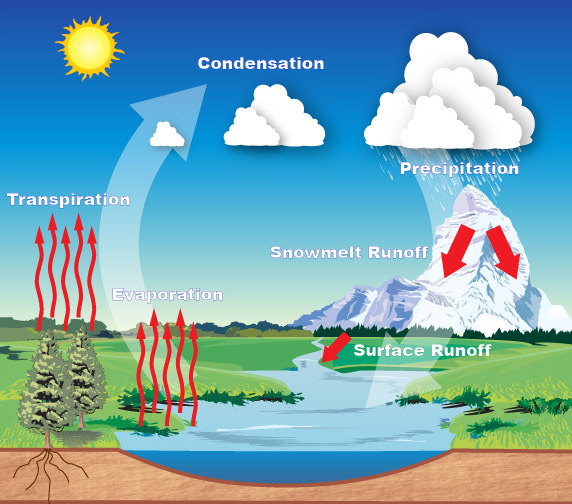 This graphical representation alone will be easier for students to understand how precipitation takes place and will be retained for a longer duration than a two-page write-up on the hydrologic cycle which will most probably be forgotten the very next day. The main principle of conveying a concept, principle or procedure through visual representation is that the learner may not experience cognitive load which may defeat the goal of instruction altogether. Use of graphics is not enough; a visual representation should be effective and fulfill the objectives by being logically and aesthetically sound for any e-learning course content. Astonishingly, many instructional designers falter in this area. The choice of multimedia will largely depend on the learner group characteristics, the complexity of content, and the goal of instruction. Here is a list of simple points that instructional designers should keep in mind while working with graphic developers. Showing change in an object, structure or person over time. 2. Learner’s characteristics and age group is a major factor of consideration while choosing/creating appropriate graphics. For e.g., a course for 20-25 yrs sales reps in the automobile sector can use a lot of bright colors and trendier design than that produced for a more mature audience. 3. Type of content is yet another importance deciding factor. Graphics are mainly used to communicate something to the learner. If a graphic representation does not complement the text with it, it may be futile to use it in the first place. For e.g., entirely different sets of graphics will be used to teach processes (flowcharts/workflows) and causal relationship (graphs). 4. While communicating complex learning objects, the simplicity of graphics should also be kept in mind. For example, a difficult and lengthy procedure can be shown with the help of numbered image for each step which will help the learner to understand them in sequence and also what needs to be done at each step. There are many more technical aspects to creation and application of graphics when considered from a developer’s point of view. We hope to cover those in another article. The mentioned points should be used as checkboxes to see whether each of these areas have been given enough though before involving resources and getting into production. In the modern corporate scenario, many companies are deploying online training courses for their employees to enhance their skill set. When it comes to corporate giants, it is almost impossible to customize e-learning courses keeping each employee in mind. The learner base may involve a range of employees, from first-time users to veterans. Therefore, it is important to design courses that answer all possible queries the learner might have about going about a course. No matter how instructionally and aesthetically well designed a course is; giving too many navigation instructions would only make the users feel intimidated. Some may even opt out of actually going through the course at all. However, giving no instructions for the user to go about the course and explore other information like the menu, job aids or glossary section isn’t a solution to that. In elearning, it’s hard to predict who will view the course and how comfortable they would be while viewing one. Therefore, navigational instructions should be such that they provide the necessary information precisely and yet be user friendly. 1. Use of a forward and back arrow to show direction of content. Likewise, using play button to prompt the user to play a video, instead of cluttering the page with the instruction to click on the play button to view the video. 2. Using a list icon for showing the menu. This is a very important tab as it gives the learner an overview of the course structure and the ability to return to a topic for revision in case the learner feels so. Area indicators or breadcrumbs are also applied to this pop up i.e. it color of the visited topics should change indicating the learners progress through the course. If buttons are being used, they should be clearly labeled. If signs are used on them, they should not be ambiguous. Contrast is an important factor; navigation aids should be clearly visible. Complimentary colors should be used to highlight button functionality. Placement and use of navigation controls should be consistently throughout all page types in a course. All navigation aids in the course should be tested before it is launched to see whether they are appropriately programmed/linked to the pages they point to and any glitches should be rectified. Some instructional designers prefer a mix of textual and graphical representation of navigation aids. This is a good approach as it is a mid-way solution. However, one should be cognizant of the verbiage and that it doesn’t make the pages cluttery with unwanted or redundant information plonked on them. After all, ease of use is inextricably linked with the user/learner satisfaction gained from a well laid out elearning course.